Though a half a century apart, November now marks the death of two Cold War icons. Just four days after the anniversary of the assassination of President John Kennedy, his nemesis Cuba’s Communist leader Fidel Castro has died at age 90. Both loomed large in my cold war childhood. It is hard to imagine today the dark shadow cast by Castro extended all the way to a suburban N.Y. child. That the fear of communism represented by the bearded bombastic Fidel Castro on a small island 90 miles from Florida could so menace an entire hemisphere seems today almost inconceivable. 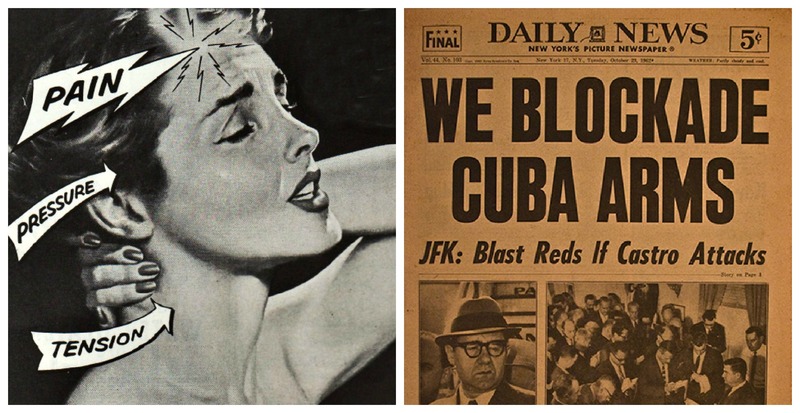 But panicked Americans were convinced Castro and his Communist cohorts were aiming to undermine the influence of the US and break ties with Latin America which was in the United States sphere of influence. Communist control in Cuba it was feared would trigger similar uprisings throughout Latin America and so extend Soviet Influence. No more so than during the Cuban Missile Crisis, those harrowing 13 days in October 1962 when Castro and Khrushchev nearly brought us to the brink of thermonuclear war. It is a story I have never forgotten and it is worth remembering again. It was late October, and trick or treating was just a few short weeks away. For that years Halloween my parents had picked out our Halloween costumes for my older brother Andy and I. There would be no glittering fairy princess with a magic wand for me. No ghosts or goblins for my brother. No, my parents had something more ghoulish in mind. Mom and Dad thought it a hoot to costume their children as Soviet Leader Nikita Khrushchev and Cuba’s very own Fidel Castro.What better way to keep a cold war chill in the air than to dress my brother and I as those 2 lovable cold war communist cut ups. But as luck would have it, I came down with a nasty case of the measles. The itchy red spots were spreading from my face to my body as quickly as Communist aggression was visualized on maps and films at school. Those scary red splotches of Communism shown slithering around the globe, oozing over continents, a ready reminder that the Russians were hell-bent on world conquest, were a familiar feature in My Weekly Reader. Now the measles red rash was on its own expansionist path with me. To make matters worse, I learned it wasn’t just plain old measles. 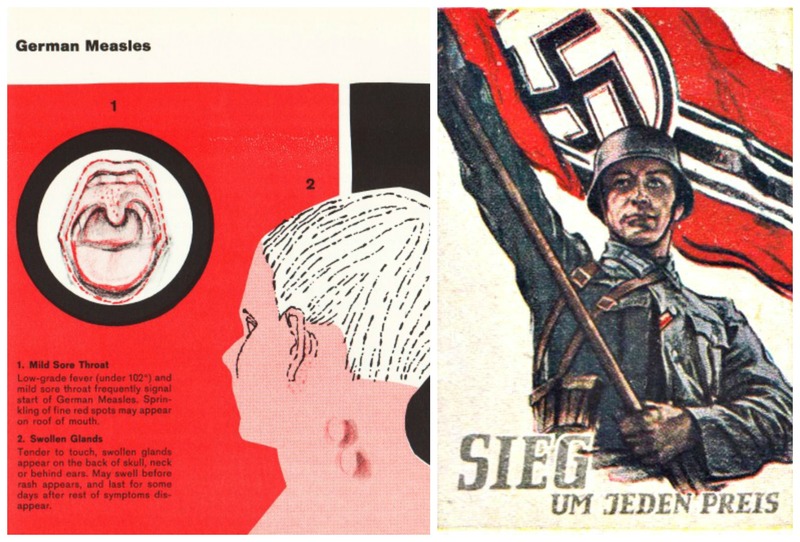 They were German Measles; Nazi measles goose-stepping across my ravaged body. Despite having been born a full decade after the end of WWII, which in a child’s mind is an eternity, I was tormented by the very thought of Nazis. I used to have nightmares that men in brown shirts, black jack boots, and wide Sam Browne belts, rank and file members of the Nazi Party would storm into my suburban ranch house, lustily humming the Nazi anthem Hort Wessel Song, brutally taking me away. 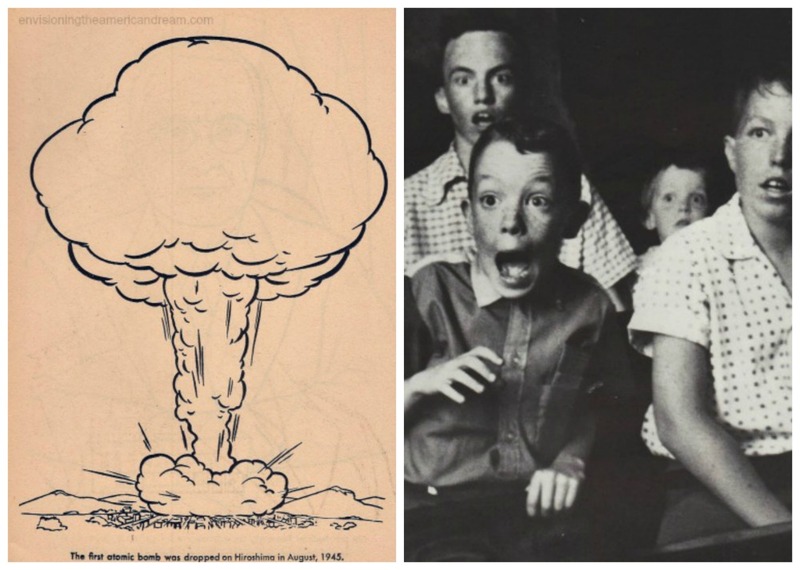 Now the Germans and their horrors fused with the Russians and their nuclear bombs, and there was nothing to stop the fiery red rash that was charging across my 7-year-old body. Monday, October 22 began as sunny clear day. A burnish of autumn on the sycamore trees that lined my suburban block made everything look peaceful and predictable. But all was not quite on the Western Park Drive front. Inside my house things were anything but peaceful; I awoke with a fever, sore throat, blotchy skin and the streaming morning light burned my watery, red-rimmed eyes. My body was clearly sending out distress signals. With a sinking feeling about the telltale rash, Mom called the doctor. Within the hour my pediatrician came to the house and confirmed the diagnosis. The spots had Deutschland written all over them – German Measles – Rubella. Solemnly my pediatrician Dr. King informed me that to prevent the spread of the very contagious disease, I would have to be quarantined. Like a heat seeking missile, a careless sneeze, or an explosive cough could shoot troublesome germs in your direction at a mile a minute speed. In case they invaded the tissues of your throat, you could be in for a cold, or…worse. I was to get back to bed mach schnell. And stay there. 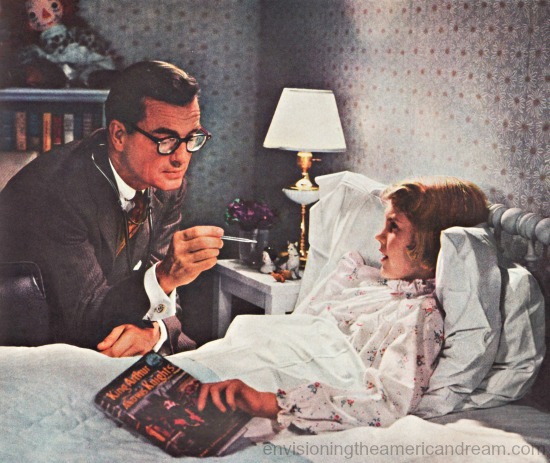 Besides bed-rest, baby aspirin and fluids there was no cure. A big brown bottle of soothing Calamine lotion along with a suggestion to clip my fingernails to stop me from the inevitable scratching were the doctors best suggestions. Not even the venerable Ben Casey could come to my rescue. There was no debate about the merits of a vaccine because there were none. A vaccine would become available for measles in 1963, a rubella vaccine wouldn’t exist until the end of the decade. October 22 was also my parent’s 12th wedding anniversary. They had planned on going to the movies that evening to see “The Longest Day”, that star-studded spectacle about D Day the Normandy invasion. But now that our normally germ-proof home had itself been invaded with a contagious disease, plans were promptly cancelled. John Wayne would have to wait. 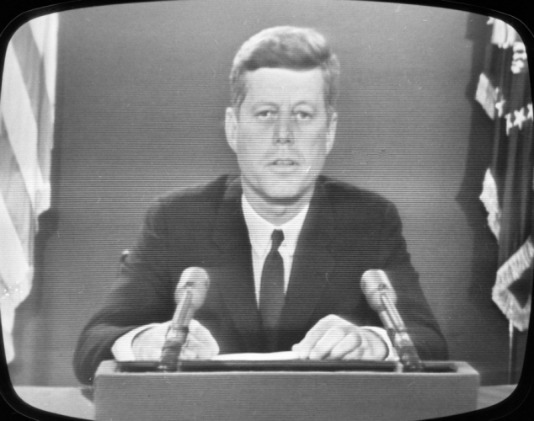 Besides which my parents were anxious to watch President Kennedy’s live broadcast on television that evening. The crisis that was brewing in Cuba that had begun a week earlier had been kept top-secret. Now with rumors circulating, there was a nearly unbearable sense of foreboding and tension. Across the country while American’s eyes would be fixed on their TV sets gripped in the most intense moment of recent history, I was confined to my bedroom without a TV. At a loss, I trained my ears to tune in to the console playing in the living room. Along with 50 million other Americans my parents listened in pin-drop silence as President Kennedy spoke about Cuba. Sitting behind his desk, a solemn President Kennedy got right to the point. This was no time to play charades. He grimly announced to a shocked nation that Russia had sneaked missiles into Cuba just 90 miles from Florida. Along with the Offensive Missiles, Khrushchev had deployed bombs and 40,000 Soviet troops. Fidel Castro welcomed them with open arms. 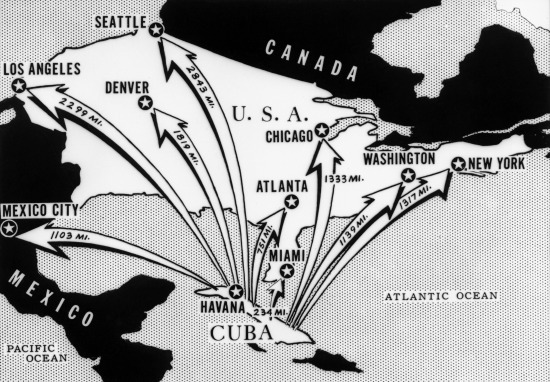 The alarming evidence from photographs showed that nearly every city from Lima, Peru to Hudson Bay, Canada would lie within push button range of thermonuclear bombs in Cuba. Every major US city would lie within push button range of thermonuclear bombs in Cuba. “To halt this offensive build up,” a determined Kennedy said, “a strict quarantine on all offensive military equipment to Cuba is being initiated.” The Navy’s mission was to block the flow of Russian weapons to Cuba. Like me, the Russians would have a quarantine imposed on them but Dad wasn’t convinced this was the best tactic. It might work for preventing the spread of the measles but not for the missiles. If Russians didn’t withdraw the missiles as demanded, a U.S. pre-emptive strike against the launch site was inevitable. The United States would not shrink from the threat of nuclear war to preserve the peace and freedom of Western Hemisphere, Kennedy said firmly. Struggling with the ramifications of what they just heard, the longest day was about to get a lot longer. 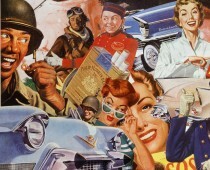 As the cold war heated up so did my fever, and I was wracked with chills. Despite being doused with great blotches of pink calamine lotion I was struggling not to scratch the angry rash that was invading my body. Hot and bothered, the US military were having the same problem. Just itching to go to war, the Joint Chiefs of Staff had to restrain themselves from scratching that very dangerous itch. The Soviets had crossed the line. They had come into our Hemisphere, their nuclear warheads aimed directly at us and we had to make sure they didn’t strike first. The time had come for a direct military showdown with the Soviet Union. We Can Work it Out? JFK and Khrushchev arm wrestling for power as they sit astride nuclear weapons in this Oct 29, 1962 cartoon. On Wednesday, when Soviet ships changed course rather than make contact with the naval blockade, there was some relief. No new weapons were being shipped to Cuba. But Hi-ho-hi-ho it was off to work they go as industrious red dwarfs continued to work day and night on the existing missiles which would soon be operational. The pressure on the President to order an air strike or an invasion was mounting. As the tension grew, many atomic armchair strategists felt strongly that the best defense was offense – get ‘em before they hit us. “If the Russian offensive build up continued, Kennedy would have no choice but to unleash the mighty US force,” Dad remarked gravely. Russian nuclear retaliation would be inevitable. An air of crisis hung over the country. 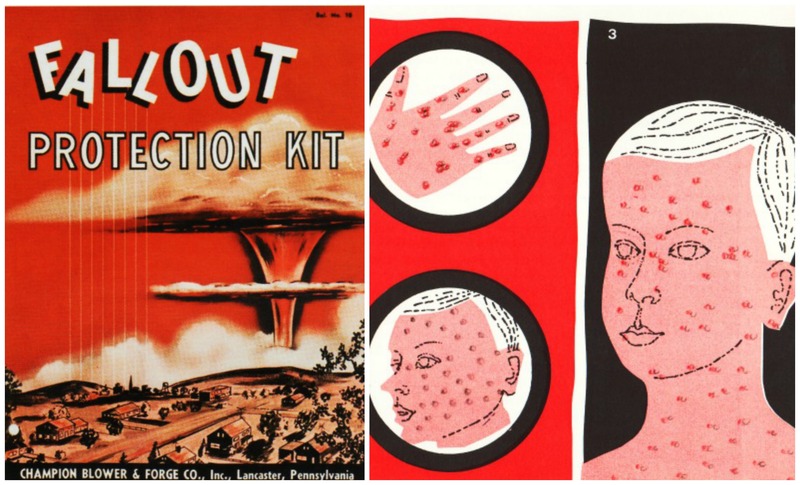 Short of building a fallout shelter, there was little anyone could do about the missile crisis, but it was all out war on the measles at my home. Prepared to do battle, Mom took the offensive with the pre-emptive striking power of Lysol, Lestoil and Listerine, to immobilize and incapacitate any rogue germs. There was a full frontal attack on dirt – every counter every surface in the house was scoured and sanitized, hands were washed and rewashed until skin wrinkled and puckered. With the containment policy strictly enforced, the days passed slowly for me but I busied myself with Colorforms, Crayolas and coloring books.What better way to pass the crisis than coloring in a picture of the Atomic Blast at Hiroshima in my American History Coloring Book. Barricaded in my bedroom, I could still hear the ominous sound of the air raid drill alarm ringing every few hours at West Hempstead High School a few blocks away. I could picture all the frightened school kids jumping out of their desks as I had done countless times, kneeling underneath desks, hands clasped behind necks, eyes closed waiting for that imminent flash. I had little sense how school officials were currently scurrying to make all sorts of contingency plans for what seemed like the possibility of a real attack. Several years earlier, my school district had developed a plan for evacuating elementary school kids in the event of a threatened enemy air raid upon N.Y.C. We had been issued plastic dog tags with our picture and address on it that we were to wear in case of an attack. On Thursday my fifth grade brother brought home a printed permission slip for my parents to sign, allowing students to participate in a practice walk-home air raid drill. In case of emergency it was thought better to be incinerated at home rather than at school. Irritable and impatient as only a sick 7-year-old could be, I was deeply disappointed that I would miss out on the fun of the walk home drill. Pleading with Mom to let me out of my sick room long enough to view the march, I wistfully watched from the living room window as my classmates, lined up in size order, earnestly paraded down my deserted block. The loud roar of an overhead jet temporarily distracted me. Anxiously I scanned the blue skies from our picture window for an enemy attack, as though it were WWII and I were a spotter standing on a rooftop scanning the skies for the sight of a Japanese flag painted on the belly of the aircraft. 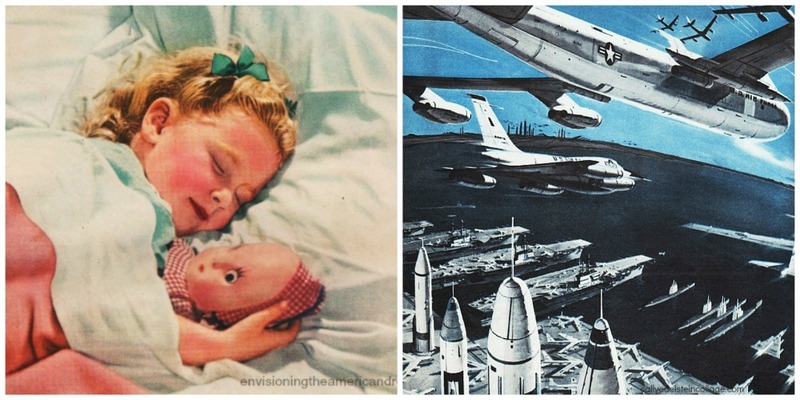 I was too young to comprehend the total annihilation of nuclear war. All I knew was, we were to be prepared. I knew a nuclear attack could occur any time anyplace any day. Would this be the day? My parents would shake their heads, as they watched me but neither of them had the heart to tell me what they already knew – that now, by the time you eyed the enemy…it was already too late. By Saturday I had taken all the orange flavored St. Joseph aspirin that I could, yet my fever had still not broken. Along with the shivering and shaking, there was a whole lot of tossin and turnin’ as the red splotches of German Measles continued their assault goose-stepping across my body. A vaporizer had been brought in to help with the breathing and between the fog and my feverish delirium, disparate sounds and thoughts merged in my mind, as I drifted between states of fractured foggy wakefulness and fitful sleep. “…..And now a word from our sponsor… This is only a test…In a world threatened by thermonuclear holocaust…. it’s new…. its different….it….gives the surest protection-the new Missiles with Gardol, wonderful new Anti-Russian fighter forms an invisible shield of radioactivity around them….They can’t feel it – taste it – see it – but its protection won’t rinse off or wear off all day, just like New Pepsodent…..
As hot as I was with fever I knew things were only going to get a lot hotter once this thermonuclear war began. 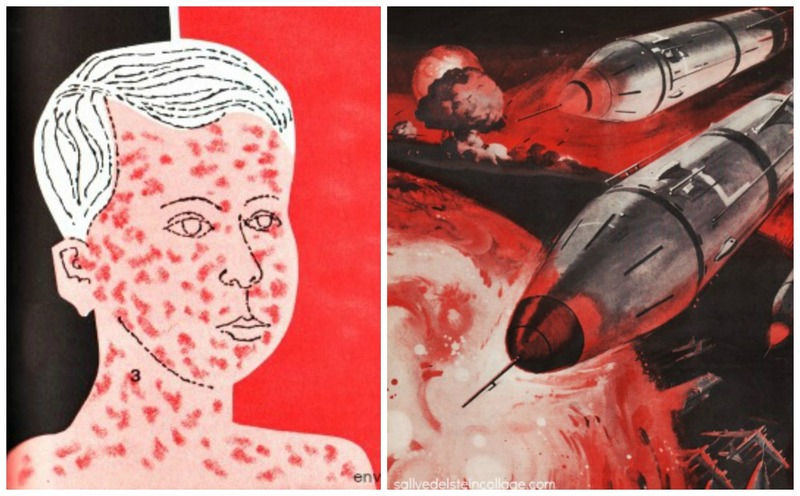 Though my fever and measles eventually healed, the cold war chill I caught that week would never leave me. © Sally Edelstein and Envisioning The American Dream, 2016. Unauthorized use and/or duplication of this material without express and written permission from this blog’s author and/or owner is strictly prohibited. Excerpts and links may be used, provided that full and clear credit is given to Sally Edelstein and Envisioning The American Dream with appropriate and specific direction to the original content. One of my favorite tunes! The best anti nuclear war song ever? Thank you for an excellent summary of those frightening times. I wish I had saved my Mad magazines! But the scene with the man leaving his woman, going to war, is an eternal one since the dawn of man. This was a great piece of memoir. Of all the memories I have of the sixties, the Cuban Missile Crisis is one of the first I remember so vividly. During that time, I was living in Fort Worth, Texas. There was a SAC Air Force Base there as well as several defense plants. My family and the family of friends all believed that Fort Worth would be one of the cities for the first strike if the Russians fired their missiles. It was truly a scary time. We breathed a huge sigh of relief when it was over and thanked our Creator for bringing us safely through it. In the history of the Cold War, I don’t think there was a time when we came closer to annihilation. All that goes to show is how fortunate we were to have the leaders we had then. It is a very good article. We were told to hide under our desks at school. It was supposed to prevent us from being vaporized by a nuclear explosion. Children to young to know. Comedian Lewis Black remembers it too. most people were happy to see the Berlin Wall come down. The so-called “free world” dramatically expanded. Thank you for a trip down memory lane. Glad to be your guide in the journey!